Earth Hour is an annual event to promote reduced energy consumption for the planet Earth by turning off non-essential lights for one hour from 8:30 to 9:30 p.m. on the last Saturday in March. It was first organized by the World Wide Fund for Nature (WWF) as a lights-off event in Sydney, Australia in 2007. Since then, 7,000 cities, 1,200 landmarks and 172 countries and territories have joined the action to raise the awareness of climate change. 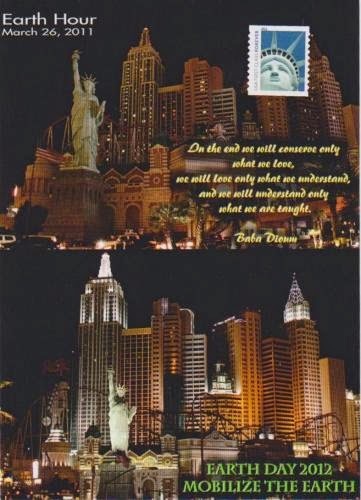 Postcard US-1630412 to the Netherlands shows New York-New York Hotel & Casino before and during Earth Hour in Las Vegas on March 26, 2011. It features a quote from a Senegalese forestry engineer Baba Dioum: "In the end we will conserve only what we love. We will love only what we understand. We will understand only what we are taught." Sent before and received on Earth Day, April 22, 2012, it also highlighted the theme for Earth Day 2012: Mobilize the Earth. For Earth Hour 2015 on Saturday, March 28, Las Vegas City Hall and the properties from MGM Resorts, Caesars Entertainment, and Boyd Gaming all dimmed their exterior lighting, signage and marquees from 8:30 p.m. to 9:30 p.m. In addition to dimming the lights, Venetian and Palazzo had put on a candlelight display at Doge's Palace Plaza in front of Venetian. 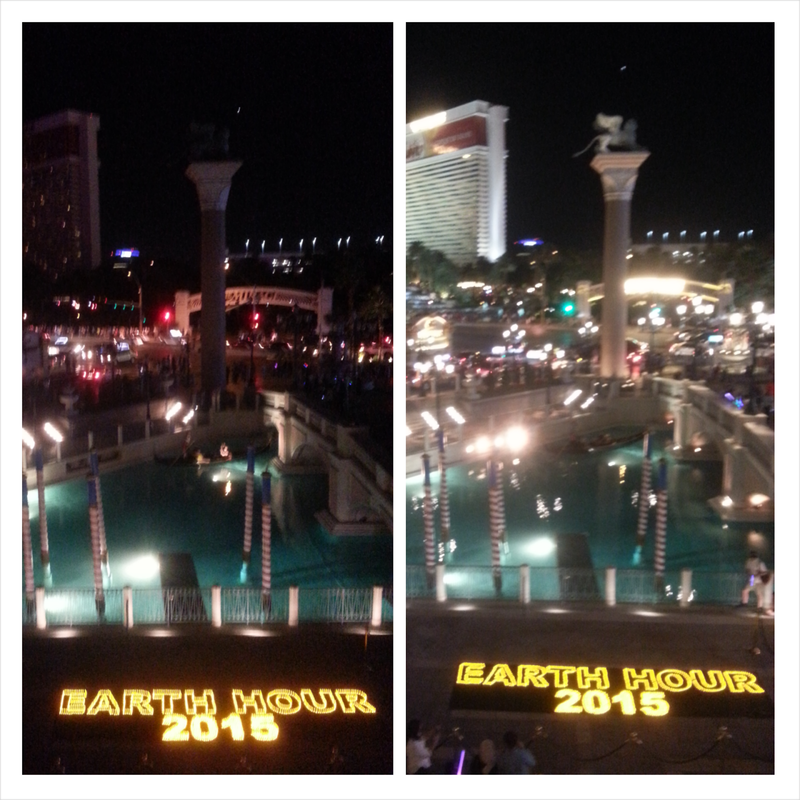 Candlelight display for Earth Hour 2015 at Venetian with Mirage dimming its lights in the background. Earth Hour 2016 will be on Saturday, March 26, from 8:30 p.m. to 9:30 p.m. local time.